- Essentials of Human Anatomy & Physiology, Global Edition (11e) (ISBN: 9781292057200) - Anatomy and Physiology Coloring Workbook: A Complete Study Guide, Global Edition (11e) (ISBN: 9781292061290) Essentials of Human Anatomy and Physiology: Now in its Eleventh Edition, the best-selling Essentials of Human Anatomy and Physiology continues to set the standard for one-semester A&P texts. With her hallmark clear and friendly writing style and meaningful analogies, Elaine Marieb emphasizes the relevance of anatomy & physiology to students’ lives and future careers. The book continues to offer just the right balance of anatomy, physiology, and clinical coverage to make the content complete, but not overwhelming. New clinical photos in the Homeostatic Imbalance feature help students visualize diseases and disorders, and new integrated Concept Links help students make connections across topics and body systems. A new, more modern design makes the book more accessible than ever, and new specific references to MasteringA&P direct students to study tools and resources that reinforce their understanding of chapter concepts. Written specifically for the one-semester course, this text presents a superior teaching and learning experience for you and your students. The program allows you to: Bring A&P concepts to life and provide real-world context: A dramatic art and photo program features 3-D anatomy illustrations, process figures with descriptive step text, realistic bone art, illustrated tables, and new clinical photographs in the Homeostatic Imbalance feature. Help students study and retain information: Effective pedagogy, including new Concept Links, Did You Get It? concept check questions, figure questions, and end-of-chapter review questions help students study and retain the information they need. Personalize learning with MasteringA&P (optional purchase): MasteringA&P provides students with engaging experiences that coach them through tough topics in A&P, with tools that help them visualize, practice, and understand A&P. Instructors can easily assign a wide range of question and activity types for automatic grading. New for the Eleventh Edition, learning outcomes and Homeostatic Imbalance features are now numbered for easy assignment in MasteringA&P. 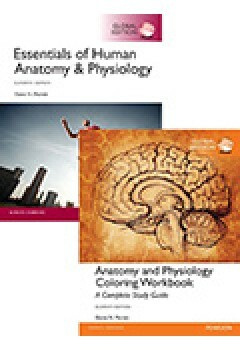 Anatomy and Physiology Coloring Workbook: A Complete Study Guide, Global Edition (11e): As an incredibly engaging study guide that can be used either independently or in conjunction with any A&P book, the Anatomy and Physiology Coloring Workbook helps students get the most out of their A&P classes. Dr. Elaine Marieb thoughtfully crafted the text to include a wide range of coloring activities and self-assessments. Students benefit from updated “At the Clinic” questions, a new major tissue figure, and updated terminology. Moreover, the text’s “Incredible Journey” visualization exercises take students on an exciting adventure through the human body. Each step they take leads them into an amazing world where they can learn more about anatomical structures and physiological functions.